Efile for VIN Corrections; correct your mistakenly reported VIN electronically with IRS. Efile for Form 2290 Amendment on Mileage Limit Exceed and Gross Weight Increased. TEXT Alert: Get the status of Form 2290 return instantly. FAX Alert: Receive IRS stamped Schedule 1 copy by FAX. 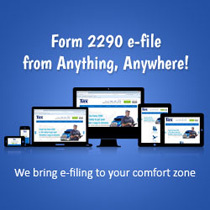 www.Tax2290.com introduces seasonal pricing to prepare and file unlimited 2290 returns. www.Tax8849.com supports efiling for Schedule 1, 2, 3, 5, 6 and 8 claims with IRS. Electronic filing is mandatory for each return reporting 25 or more vehicles that the Taxpayer files during the tax period. However, all Taxpayers are encouraged to file electronically. File Form 2290 electronically through any Electronic Return Originator (ERO), Transmitter, and/or Intermediate Service Provider (ISP) participating in the IRS e-file program for Excise Taxes. Taxpayers can now check boxes on page 1 of Form 2290 to indicate if the return is Amendment or if a Vehicle Identification Number (VIN) is being corrected. For more information see page 5 of Form 2290. You must be enrolled to use EFTPS. To enroll, click on Enrollment at the top of the www.eftps.gov web page and follow the steps. After your information is validated with the Internal Revenue Service (IRS), you will receive a Personal Identification Number (PIN) in five to seven business days via U.S. Mail. Payments through EFTPS must be scheduled by 8 p.m. ET the day before the due date to be received timely. You may use this Web site www.eftps.gov and the EFTPS Voice Response System (1.800.555.3453) interchangeably to make payments. If you are required to make deposits electronically but do not wish to use EFTPS yourself, ask your financial institution about ACH Credit or same-day wire payments, or consult a tax professional or payroll provider about making payments for you. Please note: These options may result in fees from the providers. Payments through third parties may have earlier cutoff times; please check with them for their deadlines.